The Amputee Coalition has made it a priority to ensure reasonable travel for amputees. We have been working with the TSA to assure that security screening is conducted in a reasonable and appropriate fashion for people with limb loss. 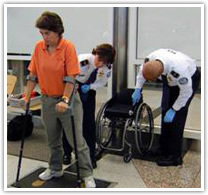 There remain concerns about the intrusiveness of screening, exposure to radiation, and consistency of screening policies for the limb loss community, and this page is meant to provide you with the information and resources for how to prepare, what to expect, and your rights when going through airport security. 3-1-1 for carry-on rule = 3.4 ounce (100ml) bottle or less(by volume); 1 quart-sized clear, plastic, zip-top bag; 1 bag per passenger placed in screening bin. One-quart bag per person limits the total liquid volume each traveler can bring. 3.4 ounce (100ml) container size is a security measure. 3-1-1 is for short trips – if in doubt, put your liquids in checked luggage. Declare larger liquids. Medications, baby formula and food, and breast milk are allowed in reasonable quantities exceeding three ounces and are not required to be in the zip=top bag. Declare these items for inspection at the checkpoint. Officers may need to open these items to conduct additional screening. Frozen items are allowed as long as they are frozen solid when presented for screening. If frozen items are partially melted, slushy, or have any liquid at the bottom of the container, they must meet the 3-1-1 requirements. If the liquid medications are in volumes larger than 3.4 ounces (100ml) each, they may not be placed in the quart-size bag and must be declared to the Transportation Security Officer. A declaration can be made verbally, in writing, or by a person’s companion, caregiver, interpreter, or family member. Declared liquid medications and other liquids for disabilities and medical conditions must be kept separate from all other property submitted for x-ray screening. Security Officers will not ask nor require you to remove your prosthetic device, cast, or support brace. During the screening process, please do not remove or offer to remove your prosthetic device. You have the option of requesting a private screening at any time during the screening of your prosthetic device, cast or support brace. You have the right to refuse the offer of a private screening; however, you will need to allow the screening to be conducted publically if you wish to proceed beyond the security checkpoint. You may have a companion, assistant, or family member accompany and assist you into the private screening area (once he or she has been screened) and remain throughout the screening process. TSA will make every effort to have two Security Officers of the same gender as the passenger being screened present during the private screening. If you are too weak or unstable on your feet to stand for a handheld metal inspection because of your prosthetic device, cast, or support brace, you may request to sit down after you have passed the walk hrough metal detector. Please notify Security Officers if you need assistance during the screening process such as a hand, arm, or shoulder to lean upon, or a chair in which to sit. At any time during the screening process you can request a disposable paper drape for privacy. The Security Officer will describe the explosive trace sampling procedure in advance to help you along with the process. The Security officer should offer you a private screening if clothing will need to be lifted or raised in order to obtain the explosive trace sample. You will not be required to remove any clothing during the process or remove or display the belt that holds your prosthetic device to your body. If the device alarms the explosive trace machine and the Security Officer cannot resolve the alarm, you will not be permitted through the security checkpoint. Finally, if you have been treated inappropriately, or are not being treated in accordance with TSA guidelines and regulations, you have the right to request at the time of your screening for a supervisor. If you are still unsatisfied with the supervisor, you also have the right to request a TSA Customer Service Manager (CSM). There is a CSM in every airport, and if requested, they will come to the screening area and answer any questions or concerns you may have, including procedures or fair and respectful treatment. They will ensure any TSA Officers not complying with TSA rules and regulations, or not treating passengers with respect will receive additional training in the future. If you are unsatisfied, have questions, or experience disrespect or incorrect screening, you can share your story with the Amputee Coalition here, and we will open a dialogue with senior TSA officials to rectify the situation in the future. You can also file a claim and share your story with the TSA by contacting their Claims Management Branch. The TSA and Amputee Coalition also encourage you to share any positive experiences you might have while going through security as well. To learn more about the TSA’s procedures, you can visit their website here at http://www.tsa.gov. The above information is taken directly from the Transportation Security Administration’s website, and we encourage you to use the TSA as a resource before, during, and after you fly.